Electricity can be generated using machines that run on biogas produced from processing palm oil mill effluent. 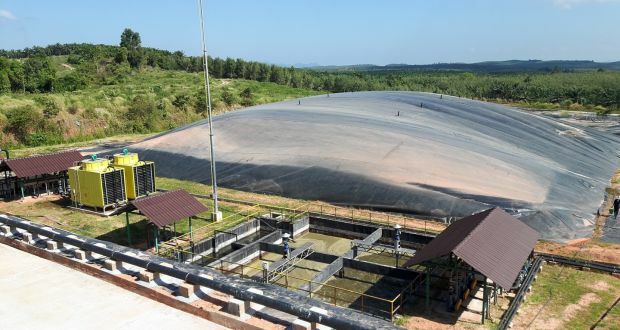 Asia Biogas, which builds power plants that turn waste into power and is owned by a group of Irish and Singaporean investors, has just started commercial operation of a project in the Thai tourist region of Krabi. “The project will export 12,300MWh [megawatt hours] per year supplying clean renewable energy to one of Thailand’s most beautiful regions,” Desmond Godson, chief executive of Asia Biogas, said after the project’s launch. Krabi Waste to Energy generates electricity using two Cat CG170-12 engines supplied by Metro Machinery. The engines run on biogas produced from the processing of palm oil mill effluent in an anaerobic digester, which was designed and built by Asia Biogas. The electricity will be sold under the Kingdom of Thailand’s Very Small Power Producers scheme to the Provincial Electricity Authority (PEA). As well as contributing to Thailand’s renewable energy targets the project captures and destroys methane gas that would otherwise be released to the atmosphere. So the project will help Thailand to meet its environmental commitments as part of the Paris accord of December 2015. A second phase of the project is planned which will utilise empty fruit bunch, a solid waste produced by the host palm oil mill, to produce biogas and a compost product which will return essential nutrients to the soil. The biogas will be used to produce electricity with a further three engines to be put into operation. Asia Biogas hopes the second phase will be operational within 18 months and is waiting for approval from the PEA.